Upon arrival we were warmly welcomed by the staff and general manager and we were upgraded to the Suite. Very helpful reception staff. Maybe more information on how it works when all meals are included. We got the menus and were free to choose whatever we wanted. Could have varied a bit more although enough to choose between. Although the property is very large they still make you feel like home in every unit you go. The staff was extremely friendly, the restaurant very flexible providing an late breakfast, appreciate this! Location is great, beautiful landscaping, and the suite was nice and quiet. Certain units include a seating area to relax in after a busy day. 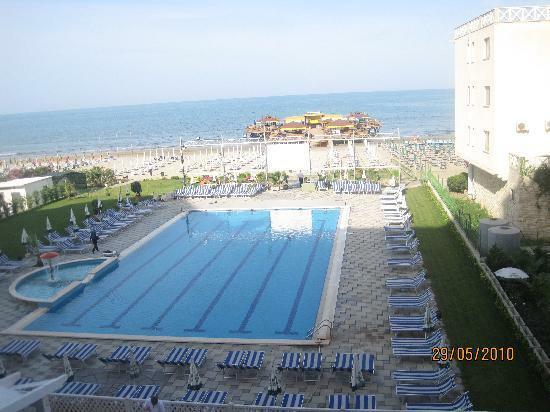 Olesia, Albania The beach is great and the personal is very nice and helpful. Ilmi, Sweden Pool is Perfect size, and the food at the restaurant is exellent. Staff is helpful, specially in restaurants. Donnie, Norway Clean, modern, good food, great pool, close to beach Lynn, Germany From the first until the last minute our stay at hotel dyrrah was perfect! The upgraded room in the actual hotel was nice, the cleaners came every day and the restaurant staff were friendly. Evzal, Denmark Very clean hotel. Sanja, Bosnia and Herzegovina Swimming pool was great, kaley and jim dating everything you expect was there. Pauliina, Finland The pool is beautiful and the beach is free if you have a wrist band that they give you at check in. Inga, Denmark The pool and beach areas with bars and restaurants are very nice, although crowded during the weekend by locals who purchase a day pass. Rooms are equipped with a private bathroom with Shower Cabins. Travellinggirl, United Kingdom Everything was perfect as always. Good Seafood and generally good food. Very kindly and helpful staff in the reception and the pool bar. You will find a hour front desk at the property. Although very well handeled when there were nothing of interest the one day. Matej, Slovenia - Very very friendly and helpful staff which weighs way up for the incidents with random visits. The pool area was very nice and the breakfast was tasty. Asim, Macedonia Although we stayed for only one night it was a true sample of excellent hospitality. Everyone in the staff was very friendly and helpful. Food was nice if you paid for it. Very beneficial is free drink along with every meal! Let us check out a bit later to have showers before heading off to Airport.